Since the last issue of the News in May, I received a letter from the Scottish Trust that we would not be permitted to use the Duffus Castle grounds for an organized gathering - for reasons of limited parking, lack of water and water closets. In spite of the the Trust's position we will still have an informal gathering on July 1st and 2nd. So you don't have to worry about paying the $50.00 U.S.! We will have an informal picnic and informal tours of the Castle and local attractions, but no Ceilidh on the Castle grounds. Next month I will be posting a list of accommodations and a list of those persons who have expressed an interest in attending. At the present moment I have interest on behalf of 50 attendees! If we can do all of this informally, there will be no registration fees! For those of you who haven't been to Duffus Castle or Moray there are tons of things to do. We suggest tours of St. Peter's Kirk, Elgin Cathedral, the Covsea caves, the quaint towns of Lossiemouth, Hopeman and the Roman well at Burghead. Spynie Palace is also a must. For you golfing Duffuses let me know if you have any interest in playing a match at the Hopeman golf course which lies one mile from Duffus Castle adjacent to Moray Firth and the North Sea. For you Duffuses who are connoisseurs of Scotch whiskey there are an incredible number of excellent liquor distilleries in Moray. You will have plenty to keep you busy. Culloden Battlefield is minutes away, while Loch Ness is approximately 40 minutes by car. Dunrobin Castle, the seat of the Sutherland Clan is approximately 2 hours away. For the venturesome, the Isle of Skye is a four hour trip from Duffus. Also, the coastal area, from Duffus east to Banff and beyond (an hour's drive), is impressive. in July, I've turned the June issue into the July issue. Fellow Capetonian MICKEY DUFFUS has been selected as manager/coach. USA, Hawaii, New Zealand, Japan, Tahiti, Mexico and Ireland. TRADITION: The Duffus family descended from King Duff (963-967), a Pictish chief of Scotland, and one of the sons of Malcolm 1st (943-954). Both Malcolm and Duff were killed in "succession" wars, both of them at or near Forres. The line was of Pictish race. Family tradition says Duff had three sons, Duff, MacDuff, and Duffus, who founded cadet branches of the clan. MacDuff were later earls of Fife, Duffus were later lords of Duffus in Moray. LORD DUFFUS CREST: A Cat sejeant, proper supports, two savages proper, each wreathed about the head and middle with a laurel, armed with a baton. BADGE: Sword and Key crossed. Motto: "Sub Spe" (Under hope. -- Without fear. )(The women must not have the motto on their signet rings). N.B. This badge is also the badge of Dunbar of Thunderton, another clan descended from the same stock as the ancient earls of Fife.1, 2. 1. There appears to be substance to use of the badge and motto for Duffuses for the reason that my cousin, Dr. John Henderson Duffus in Edinburgh showed me a brush which his father, Percy Bertie Duffus, passed down to him. Mr. Duffus served in the Black Watch during the Second World War. The brush contains an engraving of the Sword and Key crossed with the motto, "Sub Spe" appearing under it. Have the Duffuses adopted Baron Duffus' (Sutherland-Dunbar) crest? 2. With the Jamaican Duffuses records being destroyed in a fire in Jamaica, the chronicler may have been mistaken recounting that "This badge is also the badge of Dunbar of Thunderton. . . ." What history shows is that the badge was the badge of Baron Duffus - George Sutherland Dunbar. Baron Duffus' seat was Hempriggs, and Ackersgill Tower, near Wick, Caithness-shire. Coincidentally I received the following email after I received Adeline's letter this past week. enquiries arising from the following basic information. of Charlotte's cousin, was Sir Thomas Hardy, the famous novelist. married William Griffith, an artist, of Parramatta, N.S.W. possibly be a boar's head . relationship to any of the above-named person. I am interested in your suggestion for a Duffus reunion next year, but as I shall be 83 in October next, will not be able to attend. However, I shall be interested if possible in receiving a report of the gathering. I enclose a small donation. As far as Duffus castle is concerned, has it partly been restored? When a friend and I sat on its ruins in the early 1950's to eat our lunch, it was very much a roofless ruin, and offered no protection against the elements. And even the Scottish summer is not really warm - or was not the year I was there. For your interest, I shall enclose a summary of my family history as far as I know it, tho' the great-aunt who wrote it notes that "irreplaceable records were lost in a fire in Jamaica, and she had compiled the history from memory, which could be faulty." Her records only started in 1737 with the marriage in Banff of John Duffus and Mary Bissett, tho' traditions go back to Freskin, a Pictish chieftain, believed to be a very early ancestor. However, I'll attach what I have. As I am computer illiterate, I cannot use the web site. With best wishes for the reunion. The proper, irreplaceable, family records were lost in a fire in Kingston, Jamaica (date unknown) and were re-written from memory there. Motto: "Sub Spe" (The women must not have the motto on their signet rings). N.B. This badge is also the badge of Dunbar of Thunderton, another clan descended from the same stock as the ancient earls of Fife. Alexander Duffus: one of the twin sons of John the elder and Mary Bissett went out to the West Indies (no date given) and was a merchant planter and slave owner there. Alexander married Francis Smith (grand-daughter of James Washington of Ardwich. Alexander and Francis had a large family of sons and daughters and also adopted Susannah Gordon Berryman. One daughter married a Mackenzie and lived in Jamaica. Another daughter married Major Hardy, father of Sir William and Sir Thomas Duffus Hardy of the Record Office, London. Two - William and Thomas - remained in the West Indies as partners, merchants and owners of a large sugar and coffee plantation. Thomas Duffus: married Susannah Gordon Berryman on Tuesday, November 15th ?1802. Note on Susannah Berryman: her parents were Quakers in Pennsylvania. When Susannah was 10, they sent her to England for her education, but with war breaking out soon after she left Philadelphia, the vessel in which she was sailing was captured by the French, recaptured by the English, and taken into Kingston Harbour, Jamaica. The little girl was adopted by Mr. & Mrs. Gordon, under whose care she was traveling and they had her christened by their name, but soon after they died of yellow fever, within a few days of each other, she was then once more adopted by Alexander Duffus and his wife Francis, into which family she afterwards married. Susannah's date of birth is given as 7th Jan. 1784. John Duffus, b. Sat. June 9th 1804 (at his aunt's house in Kingston). Died October 17th 1870, age 66 in Auckland, New Zealand. Christiana, b. Tues. June 27th 1806. Frances, b. June 6th 1810. Charlotte, b. Tues. Sept. 29th 1812 (later married a Polish "Count Plater and lived in Australia). Laura, b. Fri. Oct. 14th 1814 (later married a Polish "Prince Alois Konstantine Driucki-Lubecki" - both went to Australia on the same ship "Eden" as her brother John and his wife and his wife and children. Note on Thomas Duffus: He was born Sept. 9th 1778 in Jamaica and died March 13th 1835 age 56 in Boulonge Sur Mer in France. At some date after the end of 1827 he left Jamaica, "probably for health reasons." On Dec. 12th 1827 he wrote to his son John in England, advising him not to return to Jamaica, where he says "There is now nothing but corruption, intrigue, and dissimulation." At this date his wife and daughters were in England (where the children went to be educated) and he sends his affectionate greetings to them. Susannah later joined her husband in France. After he died she returned to England and later followed her son to Australia and then (1848) to New Zealand. John Duffus, born Jun. 9th 1804 in Jamaica, died October 17, 1870, aged 66, in Auckland, New Zealand. He was the oldest son of Thomas and Susannah Duffus. At an early age, John was sent to England for his education. he went first to Eton, then to Queens College, Oxford, where he was an Oxford Blue and took his MA degree. After leaving college, he entered the Anglican Church and was ordained Deacon on June 15th 1828, and priest on June 28th 1829. He was appointed to the curacy of Tetbury, where he met and married Maria Henrietta Paul, daughter of Robert Clark Paul, member of an old established legal family. At an early age his health (John's) broke down owing to the severe English climate and he was advised by his physician to leave England. He applied for and obtained an appointment in New South Wales, Australia, and on May 20th 1838, with his wife and five children (all under 7, and 2 "in arms") he sailed from Gravesend in the MV "Eden" and after a 5 month voyage landed in Australia where he remained in a parish near Sidney. All his sisters and their husbands eventually followed him to Australia as did his mother. After 8 years in Australia he resigned from the ministry (? salary - could not support large family) and sailed for Auckland, New Zealand, arrived in early 1848, where he took up farming at Te Hihi, Monganui, Northland, new Zealand. He later moved to Auckland, where he died on October 17th 1870. Exact birth dates not definitely known - women of this generation were all very secretive about their ages. Elizabeth Paul Duffus, b. approx. a832, later married Taylor. Annie Duffus, b. ?1833, died unmarried. Francis Maria Duffus, b. 1835, married William Hunt. Charlotte Plater, b. ?1836, married William Ball. Robert Drucki-Lubecki Duffus, b. 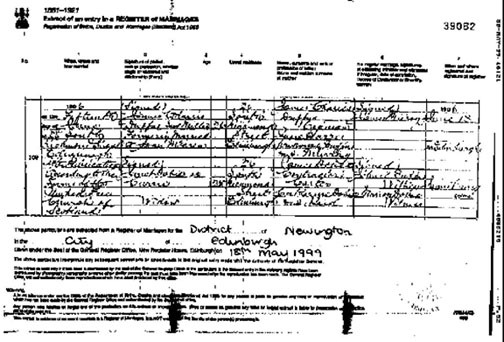 ?1838, married Lucy Ball - had no children. The above were all born in England. John William Duffus, born in Australia (Liverpool) in 1842. Later married Adeline Fleming McDonald in New Zealand. He died 19.7.1938 (age 96) in Auckland. Amy Duffus, b. 1846 in Australia, married James Sheath. Thomas Duffus, born in Australia, died in infancy. All the above came to New Zealand with their parents arriving in early 1848. Elizabeth Paul Duffus, b. 1875, died age 93 in Auckland. Never married. Was a school teacher. Adeline Minnie Duffus, b. 1878, died age 91 in Auckland. Never married. Was a physiotherapist. John Charles Kinnear Paul Duffus, b. 1.7.1883 in the Bay of Plenty, New Zealand, died 2.9.1958 in Auckland. Trained and worked as a dentist in Auckland. Alice Edith Duffus, b. ?1887, died 23.8.1977.Never married. Worked spasmodically as a receptionist for her brother, a dentist. John Charles K. P. Duffus married Ada Lilian Jackson 27th August, 1914 in Auckland. They only had one child, a daughter, Adeline Ruth, b. 30.10.1916 (me). I never married, but trained and worked as a nurse. My father was a dentist, my mother, prior to her marriage, was also trained as a nurse. I apologise for my poor typing, but thought the above records could help your comprehensive Duffus family tree. P.S. As you can see, our line ceases at my death. Attached is a Word File which contains a copy of my great grandfather's marriage certificate, hopefully this will give you the dates you mentioned in your earlier e-mail's to my councillor e-mail address. Please let me know if you require any more info. Thank you so much for your letter of 11th May. I will pass this information on to my children. It is possible Andrew could attend as he lives in the UK. But I am not sure about the rest of us. Lyall in the South Island is just changing his job and selling his house in Twizel so I fear he may be too busy to consider an overseas trip, but you may never know - so I know he would be interested in the gathering. Janet here in Hastings is likely to be too busy as she has small children, a part-time nursing job, and is studying for a degree in Nursing Studies. For myself, I most recently had my 90th birthday (3 years after Bill) & I don't think my aged bones could cope with a trip. I will send a copy to my old friend, Ruth Duffus, who is the great-granddaughter of Reverend John Duffus who was born in Jamaica. Best wishes for the success of the enterprise. We will no doubt hear more about it if you have time to pass on any information. When you asked today if I had received your recent correspondence, I said yes. Only one hour later I got your letter of invitation to "Duffus 2000." So I was saying yes to the wrong letter. I will, of course, be glad to accept the invitation (providing I'm still around for it). I mentioned George and Ann are new playing around on their new machine. Their number is "ann@hsdundee.freeserve.co.uk." George says no one has called in yet on this number - so may you'd like to try it out. 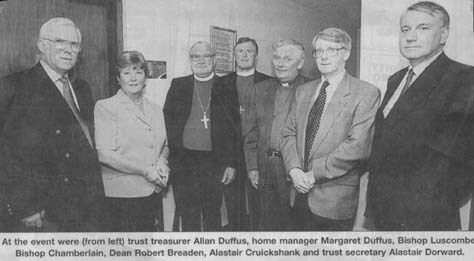 I enclose a picture from the local paper "Dundee Courier and Advertiser" showing two more Duffus's. In case they have slipped through you net. My eyes are fine now, I seem to be writing on lines now. All the best for 2000. Thank you for your letter of 9th April 1999 concerning the proposed reunion of Duffuses at Duffus Castle. I originally come form the North East of Scotland and have visited our castle on many occasions. I have often thought what a wonderful thing it would be if there was a gathering of the Duffuses at that location. It looks as though you have the same idea, but did something about it. My wife, Eileen, and I are very interested in attending, also my two sons, Gordon William and Alistair James. Gordon's wife Pamela and their two children would also like to come. My brother, Douglas and his wife, Sue, are also very interested. I have sent a copy of your letter to my cousin Margaret Duffus, now Fonlisty? in Castlegate? in Canada. As you can see if we all attend we will form a small sept of the clan ourselves. Please keep me up to date with the details and forward any booking forms etc. to me at the above address. I am not on the internet but my son, Alistair, in Wales is in the process of going live at the moment. 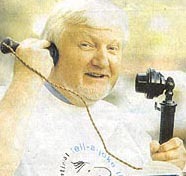 I have just spoken to him on the telephone and he has told me that he has contacted you by e-mail. I have put together a family tree as best as I can of our part of the family from James and Agnes Duffus. Also, a potted history of Jack Duffus' football career. I think we are related to George McKay Duffus, but don't know how -- will have to investigate. I can't remember in my recent letter to you giving my daughter's internet address to you, if I told you Bruce's sister Mame, lives near Duffus Castle. We visited it sometime ago when Bruce was working with Clive -- Daphne's husband, doing house repairs. We jokingly said let's put a roof on it and call it ours! Will you be able to put the enclosed on your internet pages? The only way we can communicate with you on the internet is through our daughter Janet. She is only a phone call away, but it takes three hours to reach her by road, so we can't see as much of her as we'd like. The motorways of England don't make for pleasant traveling, and I'm nervous on them anyway! Anyway -- hope to hear from you soon -- looking forward to 2000. It is said that Jack had good ball control and scoring ability. Was a keen, bustling player who would do his share of work on the field. Could be of a fiery nature. Jack's first wage with Totterham was used to buy his dear mother a pony and trap (20 pounds). During his early footballing days Jack's friends were always welcome at his parents nursery garden to have a "kick around" on Sundays or even played cricket. 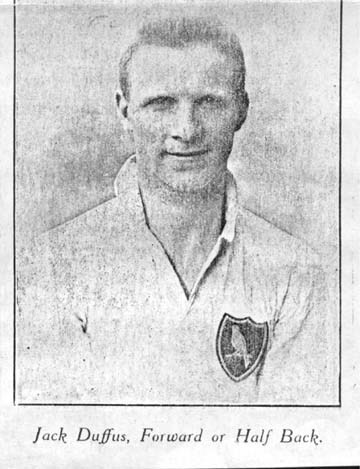 Jack's brother Bob (Robert) who was captain of Dundee, had life membership at Aberdeen Football Club. He eventually died whilst watching a match at Aberdeen. It was reported that the funeral cortege was one mile long. I just thought I would drop you a line to help you keep the directory up to date. G.J.R.Duffus was my grandfather. He died in May1982 whilst living at Guthries Haven (the address you have for him). My grandmother continued to live there until about 1992 and then she moved into sheltered accommodation.Unfortunately she died last year and so I now have no relatives living in Banff, Scotland. My father is listed under G. Duffus. His name is Gordon James and he lives at 13, Beverley Crescent, Woodford Green, Essex, England. My mother died in 1996, she was June Dorothy nee Scott. He recently remarried (24th April 1999) to Eileen O'Connor. My elder Brother lives with his wife, Paula(nee Olseen) and their two children, Georgina and Oliver, at 4, Hatch Lane, Chingford, Essex. My Uncle Douglas and Aunt Sue live at 57,Green Acre, Wembdon, Bridgwater, Somerset, England. Finally, myself. As you know, I am Alistair James Duffus and I live at 29, Five Locks Close, Pontnewyd, Gwent, Wales. As you can see, my family has spread all over Britain but we still keep in touch regularly. I hope this information is useful to you and the other Duffuses out there. I have found out my grandparents' birth dates. My Grandfather was born on 8th March 1908,and my Grandmother was born on 22nd October 1913. I hope this is of some use to you with your family trees. I am really looking forward to the get together next year and finally getting to meet you.Keep up the good work you are doing with the Duffus web page. doing Scottish Family Research are very welcome to join. Subject: Change of Address !! Hi David, coming over loud and clear! Best wishes, George. >Please let me know if you receive this and then I will drop you a short note on the Duffus 2000 responses to my invitations. > > we're having problems with freeserve. Could you try us on this number? family will be sending my grandma and someone will go with her! First of all, my thanks to you for your letter, Sunday News and CD, as yet to be enjoyed. To put it mildly, you really do a fabulous job when you take something on. My son-in-law, George Lucas, said he would contact you the modern way, but may not cover every detail. Good health holding next July will see me in Scotland, attending the ceilidh on the Saturday night and happy to pay 50 U.S. whenever, and will donate to expenses if I can't make it. I would prefer to reserve good accommodations 3 days in advance of July 1st with bathroom, please. I refer to your letter of 9th April 1999 addressed to my late father (he died 18 years ago). The letter has been passed on to me and my family would certainly be interested in more information regarding your proposed reunion of Duffus'es at Duffus Castle on 1st/2nd July 2000. I have 2 sons aged 25 and 22. The older is married living in Leicester with twins (7 months) and the younger is studying for a Master's Degree in Mathematics at Warwick University. Both of them may be interested in joining the celebrations along with my sister (who although not now a Duffus following marriage - since separated) and I assume they would be welcome. For your information my grandfather moved from Elgin to a farm in North Yorkshire around the turn of the last century and had a family of eight (six sons and two daughters). Of those sons there were six male descendants who all but one are now married with 9 descendants (male). Of those 9 -3 are now married (including my son) and who have produced yet 4 more sons to carry on the Duffus name. I look forward to hearing from you with more information regarding your celebration proposals. I was interested for you to indicate this event is only held every 1000 years and should be pleased to hear what evidence you have as to the previous celebration. � 1998 David Duffus. All rights reserved.